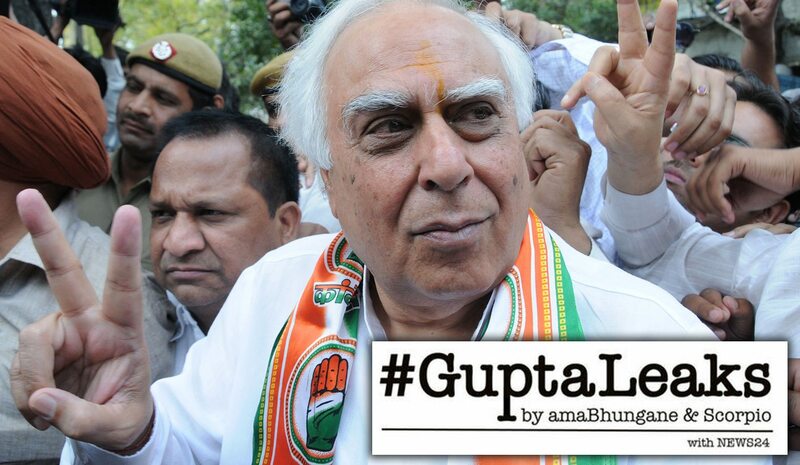 The Guptas chartered Cricket World Cup flights and bankrolled a luxury hotel stay for the family of Kapil Sibal. By AMABHUNGANE and SCORPIO. Former Indian government minister and leading Congress Party politician Kapil Sibal has refused to explain a business deal with Worlds Window, a firm that apparently helped the South African Guptas to launder hundreds of millions around the world. The suspicious money flows are explained in a new investigation by amaBhungane and Scorpio, based mainly on the #GuptaLeaks. There is no evidence that Sibal was party to money laundering or corruption, but it is worth noting his refusal to explain a deal with Worlds Window, an Indian scrap metal and logistics conglomerate. Sibal is also a top lawyer in India. Between 2010 and 2015, hundreds of millions of rand flowed between companies linked to the Guptas and Worlds Window. The money included Chinese kickbacks for Transnet crane and locomotive contracts. The transactions moved money between South Africa, China, the UAE and India. Many transactions appeared to lack commercial substance, although the source of the money was not always known. Worlds Window was founded by Indian national Piyoosh Goyal. After entering business with the Guptas in 2010, Goyal visited South Africa often. The Guptas also visited India. In 2011, Gupta staff chartered flights to ferry the families of Sibal, Goyal and the Guptas between Delhi and Mumbai, for a Cricket World Cup match. Sibal had been a government minister since 2004 and was, at that time, in charge of two portfolios: communications and information technology and human resource development. He was also a member of parliament. Sibal was joined by his wife and adult son Akhil, also a lawyer. “I have never had any dealings financial or otherwise with the Guptas. I have met Mr Gupta in Delhi only once when my friend Piyoosh Goyal invited me to watch the Cricket World Cup. Akhil also said he did not know the Guptas had chartered the flight. Later that year, the Guptas paid for Akhil and his wife to stay at the luxurious Queen Victoria Hotel at Cape Town’s V&A Waterfront over Christmas and New Year, the #GuptaLeaks show. The leaks show Goyal passed the request on to Gupta staffers, who arranged the car. Akhil said he tried to pay in full for the hotel accommodation. “At the time of checking out of the hotel in Cape Town, when we asked to settle the bill for incidental expenses at the hotel, apart from the room rate, which was already settled by us in advance, the hotel staff informed us that the incidentals had been settled at the instance of Mr Goyal. The #GuptaLeaks show the Guptas’ company Sahara actually paid. Akhil said he had no knowledge of this. In November 2013, India’s Central Bureau of Investigation (CBI) charged Goyal with allegedly bribing a senior state banker for a loan. The CBI reports to a number of ministries, including law and justice. Kapil Sibal was law and justice minister from May 2013 to May 2014. There is no evidence to suggest Sibal interfered in Goyal’s case. In fact, CBI told us that it filed a charge sheet with a Mumbai court in 2015. The case is still outstanding. Indian corporate records show that, in February 2017, Sibal became a director of Grande Castello. Until then, Grande Castello had been a 100% Worlds Window subsidiary. It appeared to be a shell company, without assets or revenues. We asked Sibal to explain his directorship of “Worlds Window subsidiary Grande Castello”. We provided him with details from the corporate records and asked him which facts were incorrect. We provided proof that the corporate register listed him, not a different Kapil Sibal. On further investigation, we discovered that Worlds Window had transferred ownership of Grande Castello into Sibal’s name in November 2016. We explained this to him and asked him to explain in light of his previous responses. We also asked him to explain substantial new loans on Grande Castello’s balance sheet and name the lender. He said: “From your last mail, it is apparent that your assertion regarding Grande Castello in your first mail was incorrect. You now abandon that position, assert a new fact, and still wrongfully accuse me of lying. “Sans a relevant factual foundation, you nevertheless proceed from conjecture to wild speculation and deem it reasonable to ask unwarranted questions, entirely ignoring the categorical responses already provided to you, which sufficiently answer your queries.